For our Jetstar Melbourne familiarisation trip, we had the opportunity to experience one of Melbourne’s newest hotel of the Crown group – the Crown Metropol Hotel. This new 658-room, $300 million AUD hotel opened in April 2010 as Crown’s third hotel after Crown Towers and Crown Promenade. Located near the Crown Entertainment Complex and Casino, we enjoyed great convenience with shopping, cinemas, excellent dining options all within 5-10 minute walk of the hotel – there was no need to brave any weather elements as the hotel is well-connected to various entertainment spots in the complex through air-conditioned walkways. Our luxe king room at 17th floor offered spectacular views of the Melbourne business district south of the Yarra River. Whether you are here for work or play (which in our case is both :-)), the spacious luxe king room caters to all your needs – we had a huge work desk from on we do our blogging and checking of emails and a comfortable reading corner with a great selection of Australian and international magazines of different genres to choose from. Check out the following video for a quick walkthrough of what Melbourne Crown Metropol hotel luxe king rooms have to offer. You will also have a glimpse of the how Crown Metropol cleverly maximises the sense of space by blurring the divide between vanity, bathroom and bedroom areas with privacy screens. Another unique feature of Crown Metropol is the cool exclusive urban oasis on level 28, the top floor of the hotel. This sky-high bar, lounge and outdoor terrace is a private club-like retreat accessible only to hotel guests. “28”, as it is affectionately referred to by hotel guests and staff, features expansive 180 degree views over the city skyline. On a clear day, the east-facing view spans as far as the Dandenong Ranges (where you can ride the fun Puffing Billy and the quaint little town of Sassafras). The Northern end of the lounge overlooks the hotel’s stunning sun-deck and waterfall-edge indoor heated swimming pool. “28” serves breakfast from 6am until 10.30am Monday to Friday and from 6am until 11am on weekends. Here you can enjoy organic and healthy produce-driven breakfast buffet which offers an extensive range of freshly squeezed juices, fresh fruit, specially selected sheep’s yoghurt, a wide range of cereals and mueslis. The organic emphasis of this breakfast is obvious from the names of the hot dishes e.g. free-range chicken, organic bacon. An expert barista is stationed each day to provide guests with their daily hit of caffeine. The breakfast menu at “28” is arguably one of the best breakfast offerings in all of Melbourne. 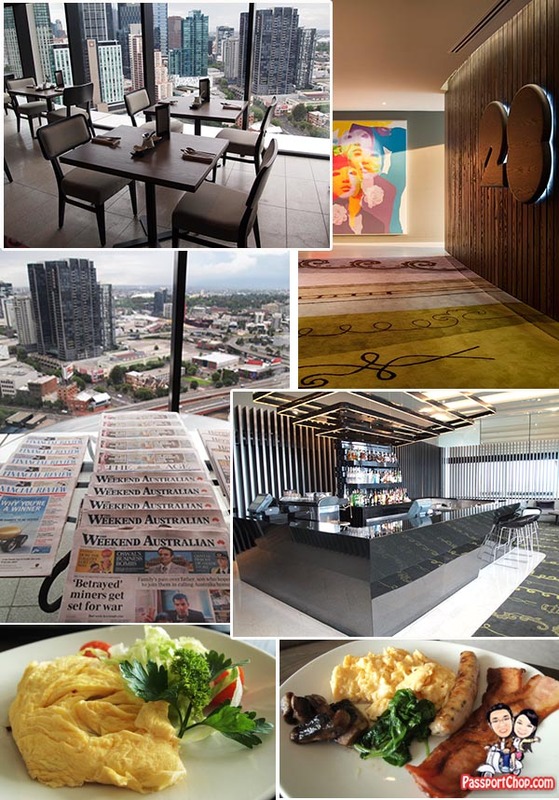 The food, coupled with a selection of the nation’s newspapers and great views of Melbourne skyline, makes a tempting combination for a relaxing long weekend breakfast or even brunch at “28”. Come sunset from 5.30pm until 7pm daily, guests of “28” will also enjoy complimentary evening drinks including Chandon sparkling wine, a range of white and red wines, Australian beers and house spirits accompanied by “28”‘s signature nut selection, mixed marinated olives and house-made dips and freshly-baked Turkish bread. For $110.00++ per room, per night, guests at Crown Metropol Melbourne may upgrade to enjoy access to the private and exclusive atmosphere at “28” – great value for those who appreciate superior service in an unrivalled setting. An impressive share, I just given this onto a colleague who was doing a little analysis on this. Thnkx for spending the time to discuss this, I feel strongly about it and love reading more on this topic. If possible, as you become expertise, would you mind updating your blog with more details? It is highly helpful for me. Big thumb up for this blog post! Melbourne is a great place in Australia and I can say that it is worth visiting. Another city I really love in Australia, the Darwin City. Where you can find nice darwin Hotel like those that are posted here. a very good post, thanks! King Room | Singapore Travel Blog”. I am grateful for all the tips. This is really the third post, of your blog I really went through. Crown Metropol Hotel Luxe King Room | Singapore Travel Blog” the very best. You really put together many excellent ideas with ur article, “Luxury Living at Melbourne Crown Metropol Hotel Luxe King Room | Singapore Travel Blog”. I may you should be coming back to your site soon.